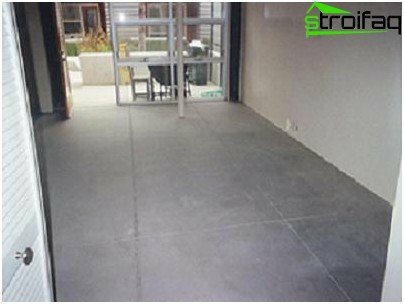 According to experts with experience inRepair and construction work, the concrete floor is the most durable and reliable. It is durable and smooth, provides an ideal surface for laying tiles or flooring of any floor covering. It is also a concrete floor in a wooden house has good resistance to breakage. Filling of the floor is not particularly difficult, and requires only a small skill. Perhaps the main drawback there is that it is quite cold. But nowadays this problem is very easily solved thanks to the wide choice of thermal insulation, finishing materials, which lay on top of the concrete base. Concrete solution - cement, water, sand and gravel. Creating a concrete base in a wooden house should be carried out by a special technology. Only then can we get durable, high quality floor. In most cases, a rough wooden floorHome - lags, which are wide boards are laid on the ground, brick columns or compacted sand. Above them lay cranial boards, which are already laid floorboards in fact. On these floors are subject to quite strong strain, begin to squeak over time. In addition, the board can start to rot away. To eliminate such troubles, you can resort to the many ways to replace the old floor. The best option, of course, would be a device in the house of concrete floors. 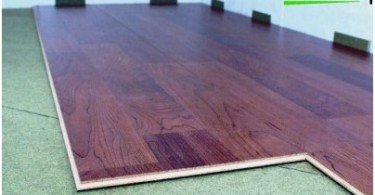 The technology of replacing woodenthe floor is quite simple and does not require any special knowledge. For its implementation must be disassembled wooden floor, leaving only the lags. If the damage affected the lag, they are also subject to removal. In the latter case it is necessary to carry out the pouring of concrete floor on the ground. In a situation where the joists are in good condition, should first pour a layer of clay and smooth. Then follow the usual procedure for phased pouring concrete floor. The lowest layer of the floor of the future will be a layerexpanded clay (you can use sand or fine gravel) that performs heat-insulating function. It will create the necessary height of the floor. The thickness of this layer may vary from 10 to 40 millimeters. Under a layer of expanded clay can be further lay a layer of plastic film, performing the function of a vapor barrier. Note that as an option for the device of concrete floor You can use screed with fillerexpanded clay instead of the usual sleep. This technology is applied in practice is much less common, but still exists. Selecting a specific type of pouring a concrete floor in a wooden house must be individualized. Top layer of insulation is placed an additional layer of insulation. This method has a positive effect on the thermal characteristics of the house in general. It is important! 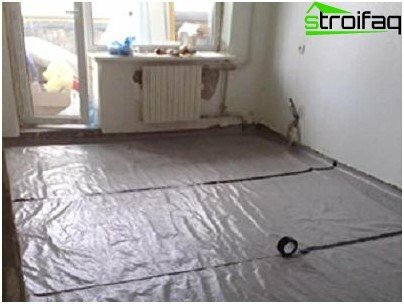 Insulation film must be laid so as to extend beyond the walls 10-15 cm. 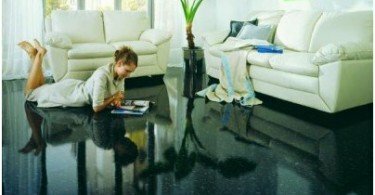 You also need to remember that the level of the base must be the same level available in the house poured floors, or taking into account the height of the flooring of the future of flooring. If, after the procedures described above forthe surface of the beams are still visible, it is necessary from special rods of metal arch certain shapes desired shape. They should ideally cover the area of ​​the beam. For the remainder of the surface is carried out the installation of a metal mesh. All future reinforcement elements laid out onthe entire floor area must be raised to 3-5 cm from the surface level with the help of special wooden or metal props. When conducting a complete preparation for pouring the concrete floor all the fittings that you want to pour a layer of concrete, should be in the middle of the layer and not touch the floor at any point. At this stage make concrete mortar. The consistency it should look like a thick homogeneous mass without lumps. The procedure of filling the entire area of ​​the floor of the future need to spend per night. Therefore, the preparatory work carried out in advance. If a future floor will house the utilities, such as electric cables, then they must be subjected to a thorough insulation. They fit into the prepared special gutter or cable channels that can prevent the risk of damage. In a situation where a very large area of ​​the house, thepouring a concrete floor can not hold a solid monolith, and different parts. To do this, use the wooden thresholds, which can then be removed or left. If you decide to remove them, then do it the next day. The resulting solution seams to be filled with a spatula. The concrete base is poured from the wall,located at the opposite side of the door, it was not necessary to go on the wet surface. Once the entire area is filled with a solution, it should be leveled with a spatula or a rule. Achieving a level surface is very important at this stage, because of this indicator depends on the possibility of placing certain existing flooring. In the first days after pouring the concrete floor inwooden house is necessary to wet the surface of about 4-6 times. Floor area coated with a layer of plastic film and leave to dry. The final drying of the concrete base takes about three weeks. The degree of drying is determined by the change in color of the material on a light gray, as well as to increase the surface hardness. You should know! The concrete floor is much heavier weight of the house construction. It is necessary to find out in advance whether the foundation will be able to withstand such a load. 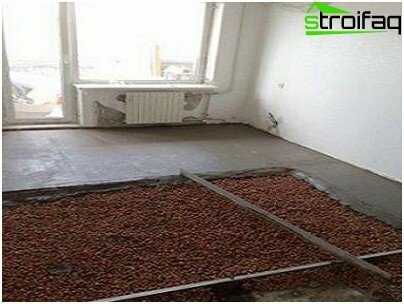 Experts do not recommend to spend a fillconcrete floor in a new wooden house, as the floor and the other elements of the house will be significantly deformed with the lapse of time. This can cause cracking of concrete poured. Prolonged operation. Such a floor could be used without repair for 20-30 years. 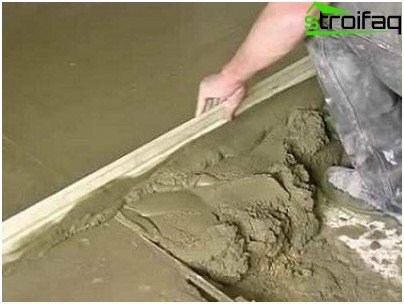 It should be noted that the achievement of highwear resistance and maximum durability is only possible when pouring the concrete floor, held in strict accordance with the technology. Also an important point, has a significant impact on the end result is a surface preparation. Careful phased implementation of works on existing technology guarantees the high quality of the finished concrete base.